Mozilla has published details of the first smartphones to be powered by its Firefox operating system. Two handsets are to be made by a small Spanish firm called Geeksphone and will be targeted at developers ahead of the system's formal launch. The platform is based on the HTML5 web programming language and is being marketed as offering software writers more "freedom" than alternatives. However, it faces competition from other soon-to-be-released systems. Blackberry 10, Ubuntu, Tizen and Sailfish are all due for release for smartphones before the end of 2013, joining a market already occupied by Android, iOS, Windows Phone, Blackberry 7 and Symbian among others. One analyst said he did not believe there was enough room in the market for all to survive. The two new handsets are codenamed Keon and Peak. Keon is the more basic model, including a 3.5in (8.9cm) screen, a 3MP (megapixel) camera and Qualcomm's low-end Snapdragon S1 processor. Peak has a bigger 4.3in display, an 8MP camera and a more powerful Snapdragon S4. Mozilla noted this was probably "slightly faster" than the first generation devices that would be marketed to the public. It added that Geeksphone's phones would be made available for sale next month, but did not provide a price. It said that when devices went on general sale they would be cheaper than many alternatives and would be targeted at emerging markets. The Mozilla Foundation already uses the Firefox brand for its web browser - an offshoot of the 1990's Netscape Navigator product. The software is developed by a community of volunteers and is run as an open source project, meaning its code is accessible to others allowing them to make their own modifications. The same principles are applied to the operating system and Mozilla highlights the fact that coders can market their apps through their own websites or any store they wish in addition to the organisation's own marketplace. It adds that the lightweight nature of the system means that apps should run smoothly and offer "optimal battery life" on low-end devices. 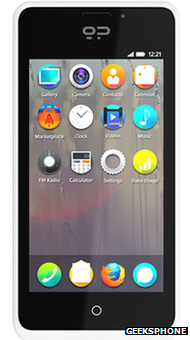 However, one analyst questioned whether this would make Firefox OS stand out, bearing in mind developers were already free to offer web apps for most other devices, and in the case of Android could also sell native apps outside Google's own Play store if the user adjusted their settings to accept them. "What Firefox is trying to do is make the web the app store and bring the openness of the web to phones," said Nick Dillon, senior analyst at the consultants Ovum. "But the question is what does this offer over a cheap Android phone to a consumer looking to buy a low-end handset? "On Android you got Google services pre-installed and the 700,000 apps in its store but Firefox OS isn't going to have these so will have reduced functionality." If Firefox OS is a success it should help drive the creation of HTML5 apps, which by their nature should work on any smartphone. In theory this works to developers' advantage as they can write a single program and then offer it across a range of platforms. However, many view the language as a "work in progress" when it comes to mobile and believe that for the time being native apps - those coded for a specific platform - offer advantages. "Although HTML5 has come a long way there are still gaps, like for notifications, that have not been fully standardised across all browsers - so if you are building an app that can alert users to the fact they have received a new message, it's easier to do in a native app if you want to ensure a consistent experience. "The trade-off, of course, is that it will take more time and effort to make the app for each platform."